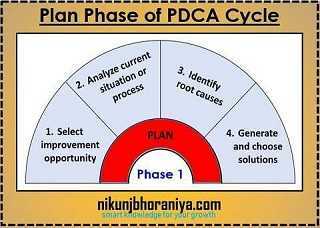 PDCA Cycle | What is PDCA (Plan-Do-Check-Act) Cycle? HomeProblem Solving MethodPDCA Cycle | What is PDCA (Plan-Do-Check-Act) Cycle? 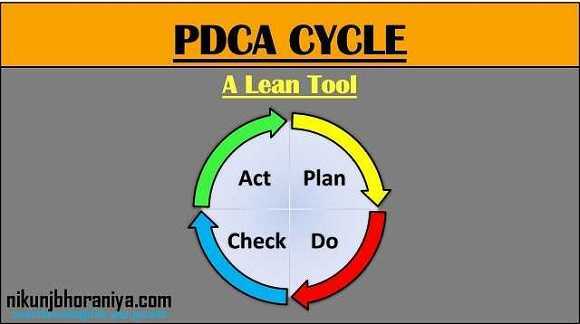 → The PDCA Cycle is the Plan-Do-Check-Act Cycle. → It is one of the popular Problem-solving Methodology. → It is often referred to as the Deming wheel or Daming cycle. → Shewhart and Deming are recognized as pioneers in the Quality Management movement. → He believed that data analysis is an essential part of any improvement effort and checking does not necessarily imply an in-depth study. → A framework for problem-solving, Continuous Improvement and change. → Widely recognized as the basis of continually improving the quality of processes, product, and services. → Provides a simple structured approach for solving Quality-related problems. → Plan-Do-Check-Act Cycle may be necessary to solve the problem permanently and reach the ultimate goal state. → Used to verify the feasibility of a proposed idea whether it is an incremental or a breakthrough improvement. 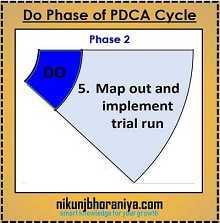 → PDCA Cycle relies on trial and error, however, it keeps on improving until it achieves excellence. → It is one of the Lean Manufacturing Tool. ➤ What is the Problem? → “Any Gap between what is expected and what is obtained”, can be called as a Problem. ➤ What are the different types of solutions? →  Correction: In a simple word "Correction is like first-aid," Correction is the instant action that is taken to correct the nonconformity or to reduce the impact of nonconformity. →  Corrective Action: "Corrective actions are steps that are taken to remove the causes of an existing nonconformity or undesirable situation or event." →  Prevention: "Prevention is to eliminate the causes of potential nonconformities or potential situations that are responsible for an undesirable situation or event. →  Preventive Action: "Preventive actions are steps that are taken to remove the causes of potential nonconformities or potential situations that are undesirable. 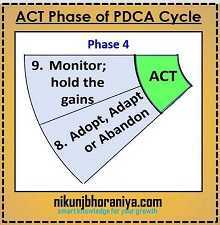 → The Phases of the PDCA Cycle (Plan-Do-Check-Act Cycle) is mentioned below in the image. → The four Phases is mentioned below in the image. 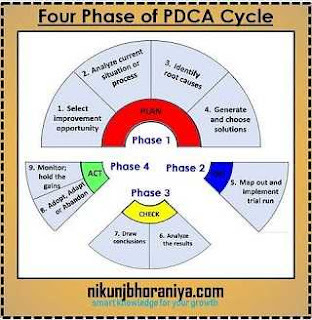 → The Plan Phases of the PDCA Cycle (Plan-Do-Check-Act Cycle) is mentioned below in the image. ➝ The problem and objectives are clearly identified. ➝ The current situation is analyzed. ➝ Check any Performance gaps are available? ➝ Utilize the Cause & Effect Matrix, Why-Why analysis or Fishbone Diagram to identify the most likely cause(s). ➝ It involves collecting data for later analysis. ➝ It ensures the solution is appropriately tested. ➝ Involves analyzing the collected data and comparing the actual results against the planned objectives. ➝ Allows discussing whether further improvements are possible. ➝ You may have to repeat the Do and Check a number of times until you get the optimum results. ➝ Was the root cause eliminated? ➝ Did the desired change occur? ➝ What could be improved/changed? ➝ What did we learn? ➝ Test again on a larger scale? ➝ Need additional/new members on the team? ➝ It is also concerned with: Standardizing, Documenting, Sustaining the improved process. ➝ Integrating it into the organization’s system. ➝ Change to department policy? ➦ You may identify the next target and start again at the planning phase. 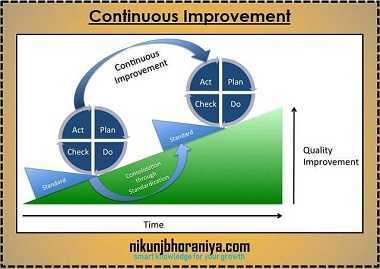 ➦ The PDCA Cycle (Plan-Do-Check-Act Cycle) can be repeatedly applied in a process of Continuous Improvement where there is no end to it. ➦ Each cycle will bring you closer to your goals and will extend your knowledge further. ➝ A common example often used is when a design team is planning for new product development. 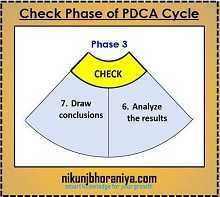 ➝ There are several useful tools of the PDCA Cycle is mentioned below. 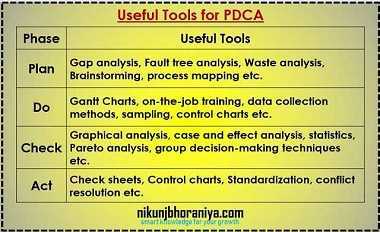 ➝ PDCA approach encourages the way of problem-solving and implementing solutions. ➝ PDCA (Plan-Do-Check-Act) approach ensures that you plan, test and include feedback before you start full-scale implementation. ➝ Repeating the PDCA cycle frequently will help to implement Kaizen and other continuous improvement initiatives. ➝ PDCA approach brings you closer to your goals as knowledge is increased: from solving problems, from failures, from the feedback received. ➝ It also Helps to reach towards a more integrated system.